24 April 12 Tips for Entering Your Recipes Into MyNetDiary Like a Pro! Get the most out of using MyNetDiary's recipe feature! These tips and tricks are helpful for new and experienced users alike. Once you enter and save a recipe in MyNetDiary, it acts like a food item. You can copy, edit, or delete customized recipes just like you would a food item. Edited recipes and their associated changes take effect going forward in time. That is, edited foods and recipes will not "retroactively" change in older food records. If you want the information in your edited recipe to show up in earlier food logs, then delete and re-enter the item in those older logs. For more tips regarding food items, please read my older post. Clicking the box, "Show Custom Foods Only"
Once you are in edit mode, you can update any field. 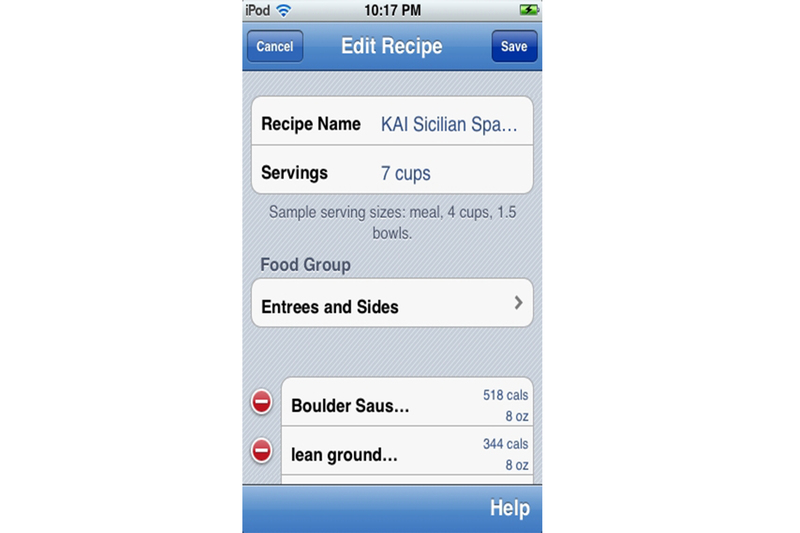 If you enter your recipe using an iPhone/iPod app, then you will be able to view and modify the recipe ingredients. You can also choose to load your recipe as a single line item in your meal or as individual ingredients. If you are a creature of habit and tend to eat the same meals frequently, then use the recipe feature to save your meal as a recipe. Just be sure to name your recipe so that you remember which meal it refers to (e.g. Joe's Sunday Egg/Ham Brunch). If you want nutrition reports to include the values from your vitamin and mineral supplements, then be sure to add them directly into your food record. To save time, make a "recipe" out of multiple supplements so that you only have to enter one item in your food record. You can also "nest" recipes – that is, you can put customized recipes in a meal, and then save the meal as yet another recipe! The most common mistake people make while entering customized recipes for batches (that is, recipes that yield multiple servings) is that they don't enter the total yield of their recipe in the "Serving Description" field. When this field is left blank, the default is "1 serving." This is fine if your recipe is truly a single serving, but a hassle if it is a pot of chili or a pizza. To give you more portion size options for food records, be sure to enter your recipe's total yield in either a volume measurement (e.g. 10 cups, 1 quart, etc) or a descriptive measurement (e.g. 10 fillets, 12 slices, 6 cupcakes, etc). MyNetDiary already does the grunt work of calculating the recipe weight for you so don't bother using weight as your yield since you lose portion size opportunities! Also, if you use standard volume measurements (e.g. 10 cups) for your total yield then the system will be able to calculate other volume units of measure too (e.g. tablespoons, teaspoons, fl oz, etc.). TIP: Take the time to measure the yield of a recipe if you plan to use it frequently – it will reduce error. TIP: If you use Cooking Light or other recipes that provide nutrition information based upon a portion size (but without portion weight), then add the entire recipe (along with the total yield in the Serving Description field) instead of adding it as a custom food item so that MyNetDiary can calculate the portion weight for you. That way, you have the option of using descriptive (or volume) units of measure or weight for portion size in food records.